The national flag carrier, Air India, has removed two of its pilots from duty for violating the Director General of Civil Aviation (DGCA) guidelines. The pilots - Jagan Mohan Reddy and S. Kiran - had allegedly allowed Kannada actress Nithya Menon in the cockpit while operating the Bangalore-Hyderabad flight last month. While Reddy was the pilot-in-command, Kiran was the co-pilot. 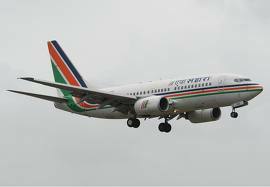 The violation came to light after a government official, who was on board the flight, reportedly registered a complaint against the pilots. Menon, a Malayali born in Bangalore, is a journalism graduate from Manipal. She, however, changed tack and enrolled for FTII Pune to become a director, there she is said to have been convinced to take up acting. Nithya Menon appeared first as a child actor in The Monkey Who Knew Too Much in 1998. Her debut as an actor was in the Mohanlal-starrer Aakasha Gopuram ten years later. She then acted in Kannada films. She has also acted in several Telugu and Tamil films. I Never felt before like I could Fly. I wish I could just Jump and Fly over the water. Or I could touch the Cloud and Sky. The unnamed Sri Lankan A team player was said to have pushed and pulled for up to two minutes at the exterior door on a packed British Airways flight from St Lucia to Gatwick. A Sri Lankan cricketer tried to open the door of a British Airways flight from St Lucia to London Gatwick while the plane was at 35,000 feet. The drunk cricketer, wearing a blue-coloured team T-shirt, told cabin crew he was searching for the toilet. The Daily Mail reported that the unnamed player from the Sri Lankan A team, pulled at the door for two minutes, creating panic among fellow passengers on the Trans-Atlantic flight on Monday. A spokesman for British Airways said that: “The event was linked to ‘an element of alcohol’. He explained his mistake and cabin crew accepted it in good faith. Cabin crew reassured customers who witnessed the event.” BA stressed that it is impossible to open the pressurised door in mid-flight. The Sri Lankan A team were flying back after a Test and limited-overs series against the West Indies A squad. The tour ended on June 27. The consortium of lenders to Kingfisher Airlines (KFA) will file a claim under the Securitisation and Reconstruction of Financial Assets and Enforcement of Security Interest (Sarfaesi) Act in a day or two. But it seems unlikely banks will be able to recover a meaningful chunk of their dues of R7,000 crore any time soon. In February, State Bank of India (SBI) deputy MD Shyamal Acharya had said banks held collateral worth R6,500 crore against loans to KFA. 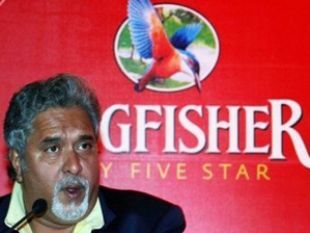 This included the Kingfisher brand, limited to the airline, which, according to media reports, was valued at around R4,100 crore by audit firm Grant Thornton India at the time the loan was given. 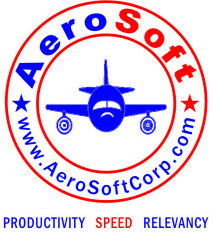 “Now in case of airlines we have to see; we have not ascertained the value of the brand yet. Since it is not flying now, the value might be much less,” Acharya told FE on Thursday. Acharya also said that the consortium will be filing a case with the debt recovery tribunal (DRT) next week. “We are looking to see what we can recover quickly but the promoter could adopt delaying tactics,” he said. 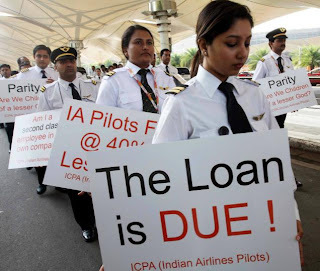 SBI, the lead lender in the 14-bank consortium, has an exposure of R1,600 crore to the bankrupt airline. Under Sarfaesi, lenders can take possession of the fixed and current assets of borrower after 60 days of sending notice, while through the DRT, lenders can use judicial powers against the borrowers. Two Air India Pilots put the lives of 166 passengers on a Bangkok-Delhi flight in danger by taking a 40-minute break from the cockpit and getting two stewardesses to operate the plane in their absence. Their stunt almost ended in disaster after one of the stewardesses accidentally turned off the auto-pilot, forcing the pilots to rush back to their seats. The incident took place 33,000 feet in the air on Air India flight AI 133 (an Airbus 321) from Bangkok to Delhi on April 12, which took off from Bangkok on schedule, at 8.55 am. Thirty minutes later, First Officer Ravindra Nath excused himself from the cockpit for a bathroom break and got airhostess J Bhatt to occupy his seat in his absense. "According to the guidelines it is a standard procedure to ensure the presence of second person in the cockpit so that if the pilot is not able to operate the aircraft for some reason, the other crew member in the cockpit can immediately call for the other pilot. But what actually happened after this made a mockery of air safety," said a a source in Air India, who did not wish to be named. Minutes after his co-pilot left the cockpit, Captain B K Soni called another stewardess, Kanika Kala, and asked her to take his seat. Captain Soni did not leave the cockpit immediately; instead, he spent a few minutes teaching the two stewardesses how to operate the aircraft. He left the cockpit after putting the plane on auto-pilot, leaving the stewardesses to operate the flight by themselves for the next 40 minutes while he and his co-pilot took a nap in business class. Putting an aircraft on auto-pilot does not exempt pilots from remaining in the cockpit; their presence is required to monitor the flight's status and turn off auto-pilot if required. This was illustrated perfectly when Captain Soni and First Officer Nath were forced to rush back to their seats after one of the stewardesses accidentally switched off the auto-pilot, engangering the lives of everyone on board. "A senior cabin crew member witnessed the entire drama unfold and brought the matter to the notice of the Airline's management. All four were derostered and later suspended for this violation," added the Air India source. Director General Arun Mishra of the Directorate General of Civil Aviation (DGCA), confirmed that all four employees had been suspended. "Following a safety violation, the airline has already suspended the people in question. 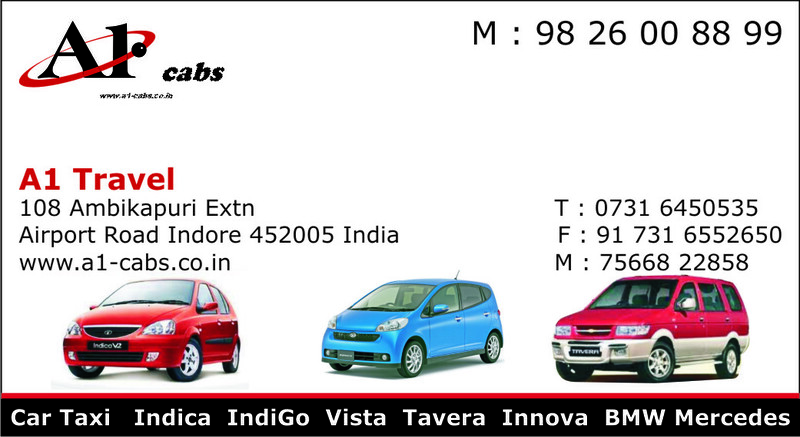 We are conducting a inquiry into the matter," Mishra told Mumbai Mirror. Captain Mohan Ranganathan, member of a government-appointed aviation safety panel, blamed the 'lackadaisical attitude' of the DGCA for the increase in air safety violations. "The DGCA should be held responsible for the increase in such cases as they have failed time and again to effectively enforce safety guidelines," said Ranganathan. K Swaminathan, deputy general manager (corporate communications), Air India, did not comment on the incident, saying, "Your query has been referred to the concerned department for comment. We will revert to you on receiving their reply." 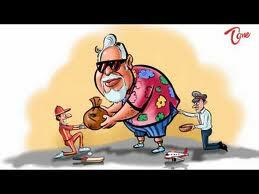 Lenders have increased pressure on promoters of Kingfisher Airlines by initiating a move to invoke the corporate guarantee provided by United Breweries and the personal guarantee of Dr Vijay Mallya. Lenders said that the next move would be to seek an inventory of assets of the guarantor. They have also raised the spectre of labeling the promoters as "wilful defaulters" if they refused to pay despite having the resources. Although lenders have sought to recall their loans KFA and promoters have been continuing to maintain that they are pursuing revival of the airline, including seeking strategic investors. Last week Etihad, the airline once seen as a suitor for Kingfisher, picked up stakes in Jet Airways. 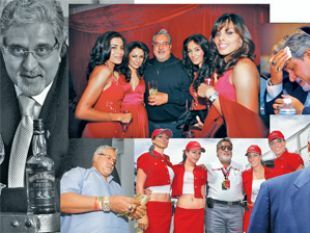 According to disclosures made to Parliament, Vijay Mallya has provided banks with a personal guarantee of Rs 249 crore, while United Breweries gave a corporate guarantee of Rs 1,601 crore. Besides this the next biggest security is the Kingfisher brand which had been valued at Rs 4,111 crore by Grant Thornton. "One way of recovery against personal guarantee from a recalcitrant promoter is the wilful defaulter list. Putting them on the list does a lot of damage because if they don't pay up all their future entrepreneurships become doubtful," said a banker. However, experts on banking laws said that it is not easy to classify a borrower a wilful defaulter. "RBI norms require the party to be given a 15-day notice allowing him to make a representation why he should not be called a wilful defaulter. Banks also have to provide him with all supporting evidence to give him a chance to defend himself. He has to make his representation before a committee of the bank and the final decision is taken by another committee including bank chief," said a lawyer representing corporate against banks. 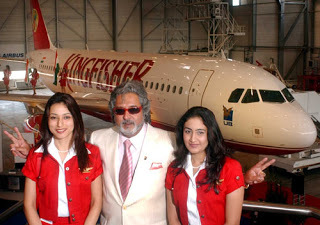 After the sale of pledged shares, lenders have now invoked the guarantees provided by Kingfisher Airlines which consists of a personal guarantee of Vijay Mallya and the corporate guarantee of UB Holdings , reports CNBC-TV18's Gopika Gopakumar. Labels: Lenders have increased pressure on promoters of Kingfisher Airlines by initiating a move to invoke the corporate guarantee provided by United Breweries and the personal guarantee of Dr Vijay Mallya. In a nursery of a private maternity hospital in Athens, three mothers feed their newborns while another three babies nap nearby. The room has only a few cots, and yet a number lie empty. Sunk in recession for the past six years and struggling to steer its economy through painful austerity cuts, Greece now faces a fertility crisis as well. “Benefits have been cut, the cost of living has risen, wages are down and there is great uncertainty,” says Leonidas Papadopoulos, managing director of the Leto hospital and a veteran obstetrician. “Couples think twice nowadays, not only for a second child but even for their first… It looks like there will be 10,000 fewer births next year,” he adds, citing estimates drawn from state and private studies. According to state statistics agency Elstat, the fertility rate in Greece has fallen from 2.33 children per woman in 1975 to 1.4 in 2011. The replacement rate, the number of births at which the population remains stable, is 2.07 children. Papadopoulos also cites a recent study by the University of Athens that found that the rate of miscarriages has doubled to four percent in the last two years. And births have gone from 118,000 in 2008 to 101,000 last year, he notes. “At this rate, Greece will be much smaller in a few years,” Papadopoulos says. The European Union fertility leader is Ireland with 2.05 births in 2012, followed by France with 2.01 children. In one of its projected scenarios, Elstat sees the population of Greece dropping to 9.7 million in 2050 from 11.29 million in 2012. A jobless rate of over 27 percent—and over 30 percent among women—compounds the difficulty facing couples today. “Policies to protect maternity are easier to apply in good (economic) periods,” says a high-ranking state welfare official who declined to be named. “In the private sector, mothers very frequently do not make use of their rights because unemployment is very high,” the official added. In Greece’s more easy-going civil service, staff can take up to 14 months in fully paid maternity leave—and have been known to obtain extra time for difficult pregnancies. In the private sector, mothers can on paper claim up to 15 months of non-consecutive maternity leave—four of them unpaid—not including holidays. In reality, however, employees rarely push to obtain full maternity leave for fear of losing their job, officials note. The Greek ombudsman’s office highlights the problem in its latest report for 2012. “Women who are pregnant or just back from maternity leave, run higher risks of…unemployment and precarious employment,” the report said. “In many cases they accept a violation of their labor rights to avoid losing their job,” it noted, adding that having children was also likely to adversely affect a woman’s pay and career prospects within a company. “We even have extreme examples of couples who have been trying to have a child for years, undergo costly treatment and then want to have an abortion because the husband just lost his job,” Papadopoulos said. Paradoxically, the axe has fallen the hardest on large families. Until last year, mothers could claim a lump sum of 2,000 euros ($2,618) upon the birth of their third child, and the same amount for each child thereafter. Then there were additional child support benefits of up to 4,700 euros a year, depending on income and the number of children, which were accessible to even moderately wealthy families. These were eliminated in 2012 and replaced with a new, means-tested system. From January 1, families are theoretically eligible for child support benefits of up to 5,880 euros — but they would need to have six children and be on the verge of starvation to claim it. Spain is a similar example of a once-generous welfare gone for good — a 2,500-euro handout per baby was eliminated in 2011. In Germany, parents receive 184 euros per month for their first two children. For the third child, the state pays 190 euros and for additional children 215 euros. In Greece, even for couples who are not in dire straits, supporting a large family is tough. “We cannot meet the needs of our three children and our parents are having to contribute from their pensions,” says Georgia Kitsaki, an unemployed hotel worker from Thessaloniki. Georgia and her husband Nikos, who is also unemployed after a labour accident, received a monthly jobless benefit of 470 euros until December, and child benefit of 276 euros. The latter has since been suspended. At 18, Mandi Cox can't afford to not think about what she can afford. The Lafayette Jefferson High School senior is one of millions of American teens who grew up during the Great Recession — and whose financial outlook on life has been shaped by it. Air India should appreciate this person. 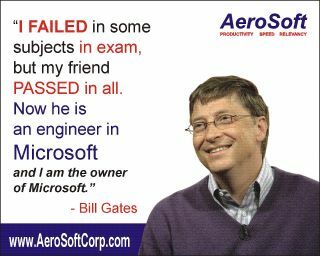 He is so proud of being a part of Air India. Due to Global Recession Even Infosys Ltd has again deferred the Joining dates of about half of the 35,000 employees Mostly from different Campuses. Sant Shri Asaram Ji Bapu New Scandel : Babri Mazad and Gujarat riots are not the only incidents which establish a nexus between crime and religion.